The teams competing in the DARPA Robotics Challenge come from some of the most prestigious universities and technologically innovative organizations in the world — places like MIT, Carnegie Mellon and NASA. However, even for them, it represents uncharted territory. “It’s a huge learning experience,” admits Bill Borgia, director of the Intelligent Robotics Laboratory at Lockheed Martin and a member of Team TROOPER, one of the groups that will be competing at the DARPA Robotics Challenge Trials in December. Borgia and his team earned the right to attend the trials during the summer when they became one of nine teams to advance from the competition’s first stage, the Virtual Robotics Challenge. 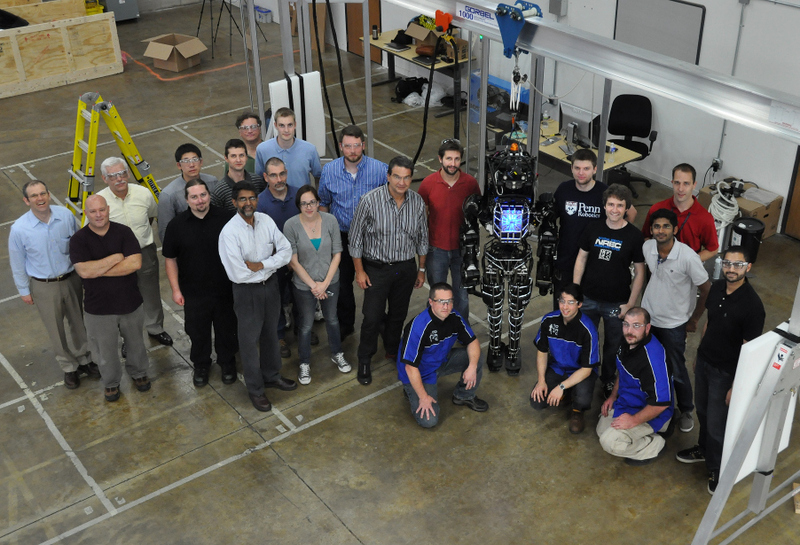 That stage tested the team’s control of a simulated ATLAS robot. Since then, they’ve been given a real ATLAS — a linebacker-sized, hydraulically powered humanoid from Boston Dynamics. At the trials, they’ll compete with their fellow VRC winners as well as teams that built their own hardware for the event, both with and without support from DARPA. Their goal — of course — is to win the competition and its $2 million prize. But beyond that, the real mission is to advance robotics to a point where robots like ATLAS can become integral to real-world search and rescue operations, saving lives in the process. For the moment, Team TROOPER — which also includes Rensselaer Polytechnic Institute and the University of Pennsylvania GRASP Lab — must be content to play out rescue scenarios in the virtual world. Although they have actual robot hardware now, much of their work still takes place in a simulator as they develop and mature their technology leading up to the competition. They verify everything in simulation before trying it on the actual robot. For one, that’s because with the robot, stakes are high. The team has to be cognizant of asking ATLAS to do things that might put it in danger (having an ATLAS robot is a bit like having a toddler who weighs 300-plus pounds). Human safety is also a priority, which is why DARPA has given each team a safety protocol. “DARPA is very concerned about not just protecting the asset but protecting the team, and we have to implement a certain safety protocol as a result of that,” Borgia says. The other reason to rely on simulations is time. Competitors received their robots less than five months before the actual competition. To be ready by December, they must scale up development teams and work on different problems in parallel. Borgia points out they have multiple developers and only one robotic platform. The timeframe is challenging, but by now teams have developed a lot of technology that they are confident will translate from simulation to reality. From now until the event, it will largely be a process of constant refinement. Team TROOPER will use a cooperative human-robot approach for the challenge, believing neither human or robot could complete the assigned tasks alone. Instead, the two will work together jointly to identify the proper course of action. The division of labor is pretty straightforward. To the extent possible, the human operator describes the outcome he or she wants to achieve, and the robot executes. So, for example, the human will ask the robot to turn a valve, and the robot will figure out the best way to grasp it and turn. For a robot, of course, turning a valve is simpler said than done. The team has to be mindful of what’s happening with the robot’s entire body to be successful — something humans take for granted. “To manipulate the valve, that involves approaching the valve using the right stance to keep the robot balanced, finding the right combination of joint motions that’s required to actually grasp to turn that valve and while it’s turning, maintain balance throughout the entire operation,” Borgia says. Teams have been given guidance on what the Robotics Challenge test course might look like, but DARPA has stressed that they don’t want the competitors engineering for one specific scenario. As such, Borgia is expecting some curve balls. Of course, that’s also exactly what he loves about the project. If you want to see the result of Team TROOPER’s efforts, the trials will be open to the public. They take place Dec. 20-21 at Homestead Speedway in Homestead, Fla. I find it disturbing that they get above in the article a free Gov. bought humanoid robot to try to win a 2 million dollar Gov. prize, this competition should have been for the private sector only, in the USA only, we need the challenge, we need the money to expand are company’s here in the USA. AT FutureBots Humanoid lab we have the ONLY private sector full size humanoid robot project in the USA, a 8 year project using private sector money, we need help, we need partnerships in the lab and donations to finish the ATOM 1.0 and to start building the ATOM 2.0 for the 2014 DARPA competition, every part of the ATOM 1.0 was built by one person, Dan Mathias a Robotics Scientist with over 40 years of Real world engineering experience..
Dan Mathias at FutureBots Humanoid Lab..